Be sure to confirm the rates for the exact time you wish to visit. Be sure to contact the owner to get your pet approved BEFORE you book the reservation. Picture a cozy log cabin situated in the scenic San Juan Mountains and whether its summer or winter you have the perfect Colorado vacation site! It is a serene place where you are able to enjoy the amenities of Purgatory Ski and Summer Resort and the historic town of Durango without the crowds and noise. This is a real log cabin nestled in a beautiful heavily wooded area near two high mountain lakes but close to Durango (20 minute drive in the summer) and 12 minutes south of Purgatory Resort. The closest lake is Electra Lake which is a 20 min hike or 5 minute drive. We even have a canoe with car carrier that you can use! The fishing is great and there is a wonderful restaurant right on the lake open in summer. There is also a flat screen T.V. in the living room as well as an IPod/IPhone dock for playing your own music. A portable DVD player is available for your favorite movies. We have a small library of books and movies for your use. Sit in front of the fire or soak in the hot tub under the stars. There are no street lights so the night skies are just amazing! Enjoy the mountain serenity while dining outside on the patio. A gas BBQ is available in summer to cook up all the fish you catch!! A full kitchen and washer & dryer offer all the comforts of home. A short 7-12 minute drive takes you to the Purgatory Ski and Summer Resort, home to some of the best Nordic and Alpine skiing in the Rockies. How about a romantic sleigh ride and then cozy dinner, snowmobiling, snowshoeing or simply reading in front of the fire.This winter wonderland is perfect for relaxing or enjoying winter sports. In the summer, the area comes alive with scenic chair lift rides, alpine slides, music festivals, and world class mountain biking. Look out your front windows of the cabin for a wooded aspen and pine view with a backdrop of mountains. Visitors love that this northern area of Durango is often 8-10 degrees cooler in the summer than downtown Durango! This charming cabin is surrounded by hundreds of miles of scenic hiking and biking trails where wild flowers, waterfalls, and wildlife abound. Perhaps you would enjoy white water rafting, world class fly fishing or golfing. Or take a ride on the famous Durango Narrow Gauge Railroad to the historic Silverton, a charming mining town in its heyday. Visit Gold Mines... Ghost Towns... 'Go Jeeping' on Incredible Mountain Passes! Serenity and beauty surround you! Note: In winter only , you must have four wheel or all wheel drive . They do plow the roads but this restriction is strictly enforced for safety. I, Kimberly, came to Durago in 1993 to recuperate from a car accident at my high school friend's bed and breakfast. I had plans to return to the corporate life in FL but fell in love with this darling mountain town and lifestyle. I bought a Deli at Purgatory Ski Resort in 1995. This was a quite an adventure for me since my background was in business and healthcare. But a great decision since I met my future husband "Mac" Mackey. He was retired and was living his dream as ski instructor. We both had years of working and playing at this wonderful ski resort. Eventually, we started our vacation rental property management company and at times managed up to 27 properties. We have semi retired now and just manage our own properties. We are enjoying our "backyard" of incredible beauty and the historic and wonderful Durango. After big city living (Chicago for Mac and Miami and San Francisco for me) - we think we are in paradise! We purchased this cute log cabin approx 20 years ago. This was one of those hard to find log cabins in the woods. Its location in the the beautiful north county area was perfect. We both dreamed of a log cabin in Colorado mountains. This is it! The Mackey Log Cabin is a perfect 4 season property. 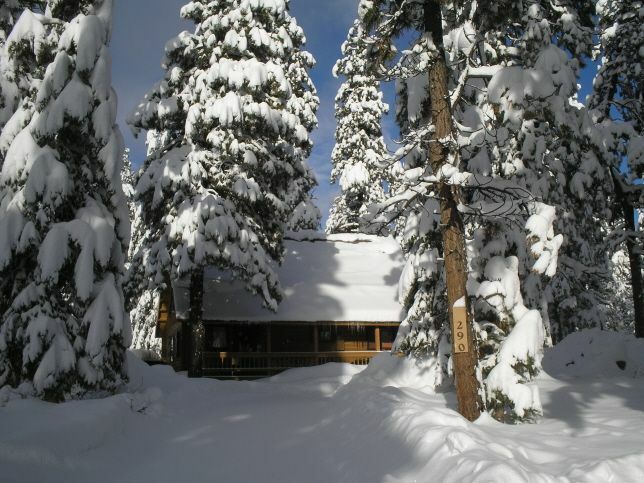 Only 6 miles from the ski resort - it offers a winter wonderland. In summer, the 5 minute drive (or 20 minute hike) to beautiful Electra Lake makes it ideal. While only 20 minutes from downtown Durango, it is often 8-10 degrees cooler than downtown and is surround by beautiful woods and scenic mountains. Mountain Views from living area and front deck. Back patio that backs up to 15 acres of wood has some views. Electric baseboard heat with own thermostat in each room . Cozy down comforters on queen beds. Large driveway for guests vehicles. Has big glass front for watching the fire. Or open it up to roast marshmellows. There is seating for 6 with folding chairs for the 7th person. Flat Screen in downstairs queen bedroom TV. in living room. Canoe with carrier available for your use. Front deck faces mountains. Back patio faces 15 acres of woods with plenty of dining/lounging area and hot tub.. Ski Resort about 12 minutes away. All rooms but one bedroom are on the same leve. There are two steps up to get to entrance. Doorways are of regular width. Sit under the stars for nightly soaks. During the days enjoy views of the mountains from hot tub.